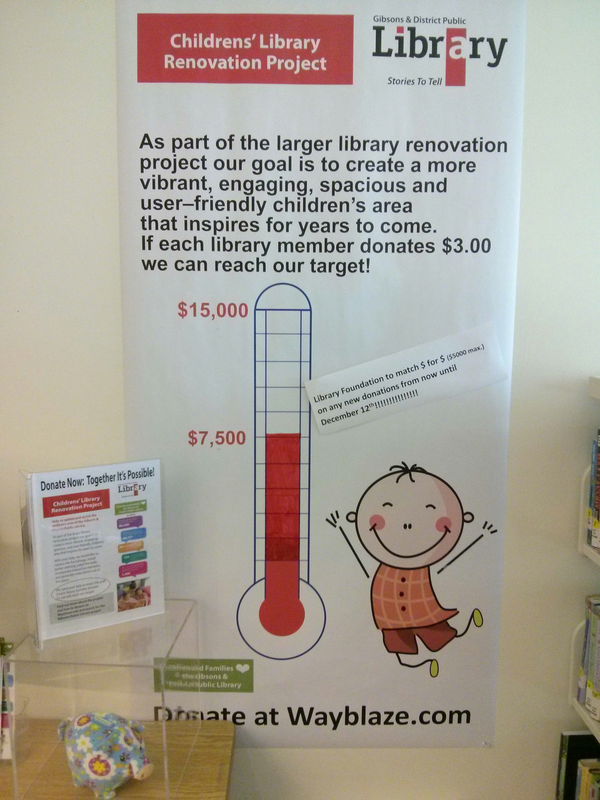 Help us update and enrich the children’s area of the Gibsons & District Public Library. Wow! This project is overfunded 200%. With your help, we would like to replace the furnishings, install better shelving, paint the walls, incorporate interactive elements, and generally make better use of the space. We need your help to enact the goal; if each library member donated $3, we would reach our target! What happens at the Library? In addition to lending out thousands of children’s materials each year (over 30,000 in 2015), the Gibsons & District Public Library prides itself on being both a welcoming place where families can slow down and spend time together, as well as a dynamic hub of programs that keep children and their families learning, creating, exploring, wondering and connecting all year round. We offer weekly Bouncing Babies and Pre-school Storytime programs, monthly Tween and Teen Book Clubs, March break programs, Summer Reading Clubs and Creative Minds Camps, a volunteer summer leaders program, movie nights, as well as a variety of after-school and weekend programs such as: knitting, stop-motion, creative writing, cardboard challenges, book folding, and more. We also host author visits and book launches whenever possible, provide puppets, costumes and other interactive games in our children’s section, and are always open to hearing about other programs the community would like to see offered here. Our overall fundraising goal is $15,000 with an initial goal of $7,500. If we raise additional funds this money will be spent on boosting the Library's digital literacy tools for kids including tablets, headphones and educational software. Every donation (large and small!) will be recognized publicly at a celebration at the Library. If you are interested in DONATING simply login or sign up first then enter the amount you are happy with in the donation box above then click the 'DONATE NOW' button. This will take you to a payment page where you will be able to complete the payment details. Please note! Your donation will ONLY be processed if this project reaches its funding goal. If it does not then no money will be taken from your account. The Library can issue Tax Receipts for donations over $50.00. With proof of your donation we will issue you a receipt; contact the Library for details. It's super easy! Simply enter the amount then click the 'Donate Now' button. You will be taken through to a payment page where we will ask you for your credit card details. If you cannot donate to this project you can still show your support by liking or sharing this project using the links below. This exciting new space for our children and families is a dream come true. Work in the children's area will start in March/ stay tuned for more details. Happy Holidays! We are very excited to announce that we reached our total goal of $15,000 ($15,001 to be exact!). Thank you again to everyone who supported this project and especially to the Library Foundation for adding an extra incentive for community members to donate. We are still excepting donations until 11:59pm pst. All funds raised over $15,000 will go towards digital literacy tools for kids such as tablets, headphones and educational software. Stay tuned for a final update. We are so close to reaching our total goal of $15,000. This goal will allow the Library to complete phase 1 & 2 of the Children's Library renovation project all at once. There are still 3 days left and any funds we raise above the total goal of $15000 will go towards boosting the Library's digital literacy tools for kids including tablets, headphones and educational software. Thank you to all the supporters of this project for donating and helping spread the word. We hope you continue to spread the word over the next couple of days and help us reach beyond our target. WOW! 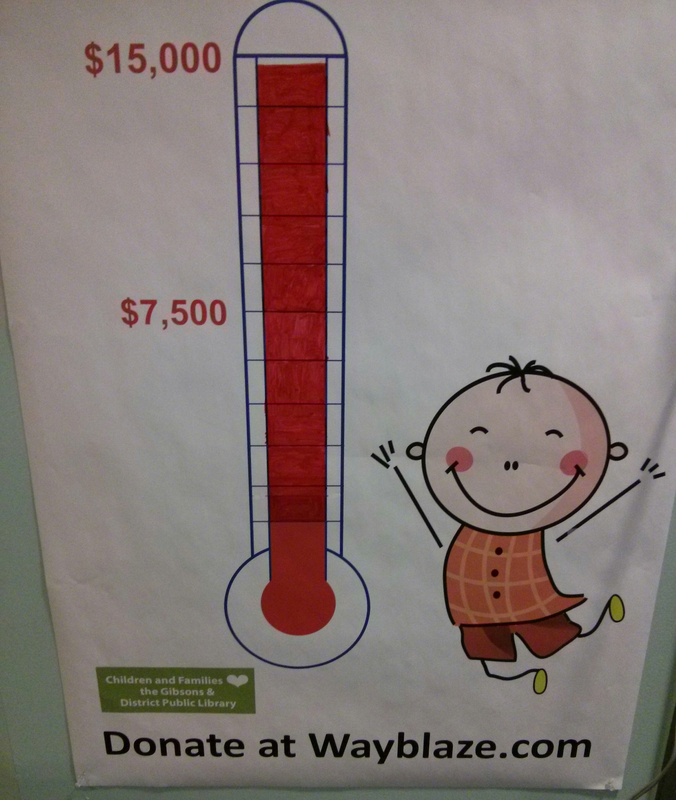 We reached our fundraising goal for Phase 1 of the Children's Library renovation project. The Phase 2 goal is also $7500 and will help the Library to purchase additional furniture and interactive games. You can continue to donate online at wayblaze.com until December 12th - just 4 days! Thank you again to all the backers for donating and helping spread the word. 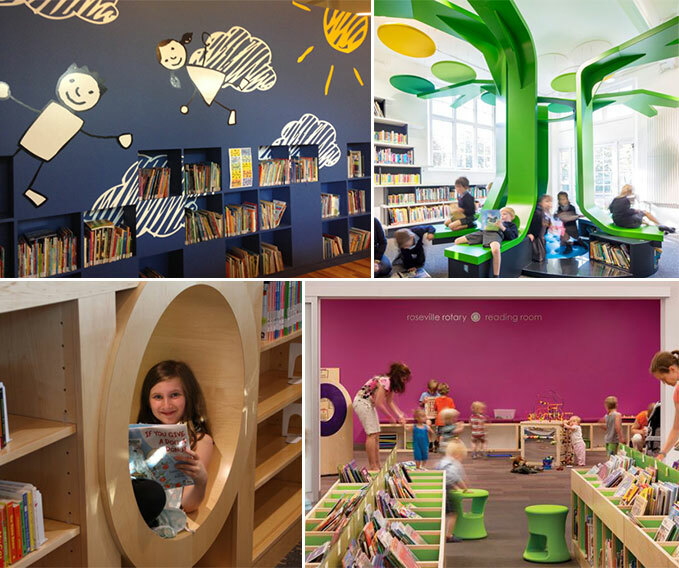 We are excited to announce that the Library Foundation has agreed to match, dollar for dollar, (to a maximum of $5000) on any new donations to the Children's Library renovation project. We encourage existing donors and potential new donors to please donate between now and December 12th to help us reach our target - together it's possible! Who is the Library Foundation? The Gibsons & District Library Foundation's mission is to generate long-term funding in support of the Gibsons Library and its services. It does this by receiving gifts, bequests, funds on behalf of the Library. To help ensure we meet our minimum funding target, we have decided to divide our $15,000 project into two phases. That way, if we don't meet the full $15,000 target by the Dec 12 deadline, we can still receive the funds for the first phase of work. 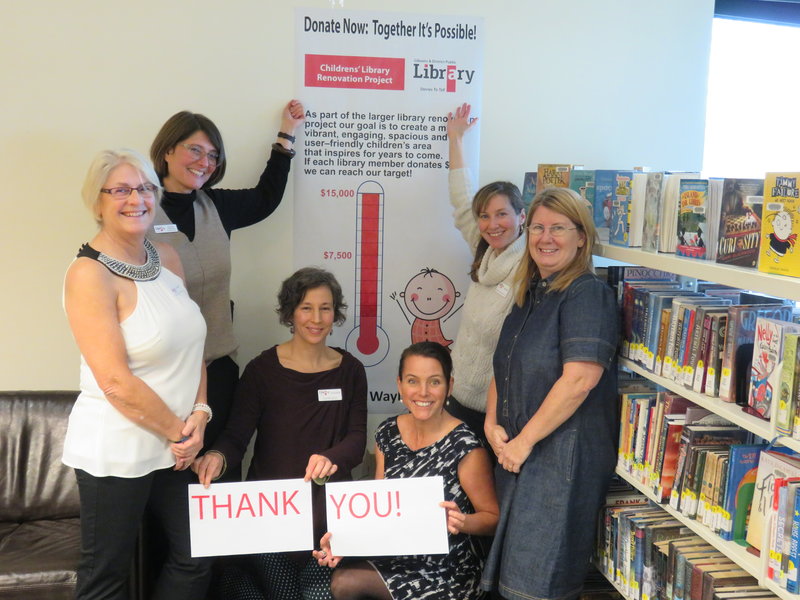 Thank you so much to all our supporters you have pledged support for our Children's Library expansion project so far. We are confident that we can raise enough funds to successfully complete the first phase and build momentum to reach our ultimate goal of $15,000. Amazing to get this first Wayblaze project fully funded.